Every time I tell someone that we made Peanut Butter Playdough people want to know more about it. My kids LOVE playing with it. The best part is that they get to eat what they create. Kids love edible crafts! 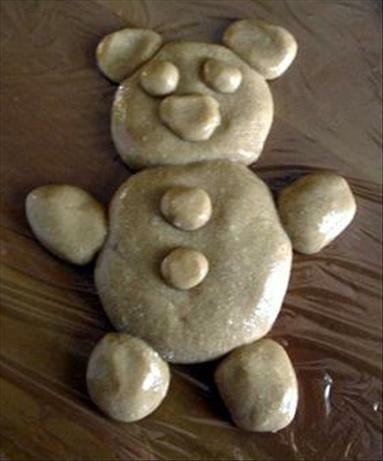 Peanut Butter Playdough is perfect for those cold or rainy days when kids are stuck inside. Usually, kids hate being stuck inside on those boring days, but they will love playing with this stuff! I love that I always have the ingredients on hand for just such emergencies! Mix all ingredients in a bowl, using your hands. Dough should feel soft and pliable. Form shapes and be creative! Storage: This MUST be stored in an airtight container. If you want this to be a small portion of another snack you can have your kids make small things that can be put on top of graham crackers or apple slices. They could also place their creations on bread. My kids love doing this “craft” because it is edible, fun, and they can be creative. I hope you will try these. They can be a lot of fun. hi..first time coming by.. hope you can drop me an email regarding to reviews.. thanks!